Kyle & Lauren - Married!! January and February are gone and I'm on the road again heading west, right now I'm in Sonora, Texas... sort of half way between Florida and San Diego, California. The weather is very nice and hay fever season has started - hooray for antihistamines! In the last newsletter, I was in the middle of my Florida gigs and these continued to go well. My brother, Doug and his wife Marjolein arrived in Florida for my last shows in Nolans at Cocoa Beach, then we packed our winter woolies and headed up to Wisconsin (by plane) for my son, Kyle's, wedding. Wisconsin was very cold after Florida but not as hard to get around as I imagined it might have been. It was great to meet so many of Lauren (my new daughter-in-law)'s family and friends, see our friends and meet Kyle and Laurens friends from the Netherlands, USA and Japan. I am delighted that they have such good people in their lives. We shared unforgettable experiences together and before we knew it, we were back in Florida again. 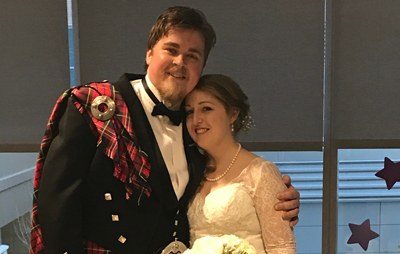 Our son is now married to a really wonderful girl. Next, we had a tour of Florida with Doug and Marjolein which also included a show in North Port. I was booked to play at the Common Ground meeting hall which is also the KDW Radio station. We arrived there early evening and met R.J Malloy, the station manager who was dripping with a cold and looking like a misery that you see advertising cold medicine on TV. I got set up, sound checked and chatted to RJ for a bit. It turned out he is friends with Billy Connolly - who has been my hero for as long as I can remember. The stories were flowing and soon it was time for us to shut up and me to play. I had messages from all over, Linda Ross and David Reid - our hosts in Hawaii in March were also listening in, my phone was going crazy! Bud hopped on to the stage a few times for radio announcements and to chat a wee bit with me live... he was great - a fine lad with a big radio voice. Live radio is a new experience - and one I enjoyed immensely. After Doug & Marjolein headed off back to Europe, we left the Orlando, Florida area and have been driving west ever since. We drove through Alabama, Mississippi, Louisiana and now we're in Texas, heading for San Diego where we will store our home on wheels and fly to Honolulu, Oahu, Hawaii all ready for a great loooong St Patricks celebration. 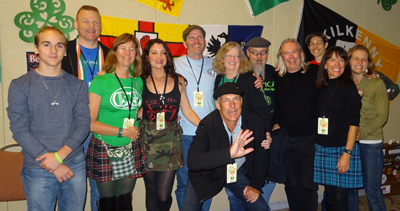 I played in Honolulu a year ago in February - we loved it there and the Irish and Scottish crew (who are incredibly active) took great care of us... so much that when Bill Comerford, who owns four Irish pubs there, wanted me back to play St Patricks week... I couldn't say no. After Hawaii, we'll pick up our home and travel north to Portland, Oregon where I will play at Mahers, Lake Oswego on Friday April 21st and the Bethany pub April 22nd. Then we're off to Europe, first to the Netherlands then over to Dundee Scotland. I'm booked to play at the bowling club in Dundee. There will be other gigs which are in the works popping up while I am there - however there are many non-music-ey things we've planned during the Summer which need attention. 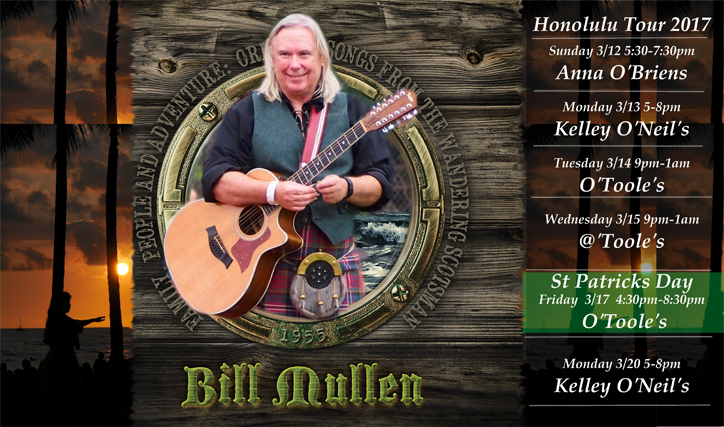 I'll be back in the Pacific Northwest in August, playing at the Galway Bay Irish pub and restaurant in Ocean Shores 11th and 12th of August. I'm ever-hopeful and keeping space in my agenda for a gigging visit to Wisconsin in August or September and see the happy couple. I'm also hoping to line up some special gigs in Portland, OR for when I'm there this summer... more on that next month. Newsletters There is a feature on my website - you can see the previous newsletter updates going back to August 2014. Each new newsletter is archived there. As I look back at our time in Florida this year, we enjoyed it very much. The Nolans were / are great ; Gillian - you (and your clan) are brilliant ; Arthur and the Scottish godfather Hugh (shame he's not from Dundee though !) and the wild corner gang in Four Green Fields - you're magic ; R.J, and Bud from the Common Ground introduced me to live radio - marvelous ... and Dorothy from Canada who sent a cracker of a recommendation up to a festival organiser in Canada... thank you! Thank you all. Dorothy and I had a ball. Fortunately we continue to meet great people everywhere. I made more contacts this time than ever, met more great people and played more places. 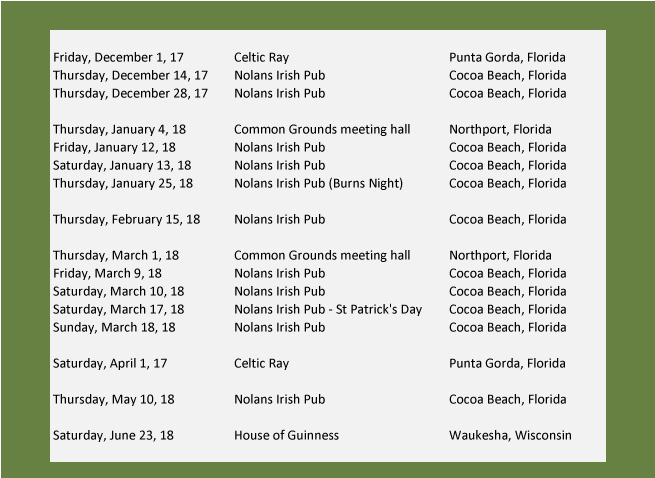 I will be back in Florida next winter and am hoping to have a really nice line up of shows to play while I'm there.